From the Department of Neurology (M.S., A.K.M., R.P., C.K. ), University Hospital Essen; Clinic of Neurology with Institute of Translational Neurology (C.C.G., A.S.-M., H.W., S.G.M. ), University Hospital Münster, University Münster; Institute of Neuropathology (A.J. ), University Hospital Essen; and Institute of Pathology (H.A.B. ), University Hospital Essen, Germany. (A) Immunohistochemical detection of leukocyte infiltration in the liver of the fatal case patient with DAC-induced hepatic injury (DIH) compared to the case of a 39-year-old RRMS patient with AIH but no further relevant medical conditions. At timepoint of biopsy, this patient received glatiramer acetate without any further relevant co-medications. Seven-micrometer paraffin embedded sections were stained, with anti-CD16 (macrophages, neutrophils, NK cells), anti-CD3 (T cells), anti-CD4 (T-helper cells), anti-CD8 (cytotoxic T cells), anti-NKG2A (NK cells), anti-CD19 (B cells), and granzyme B (GranB) and matching fluorochrome-labeled secondary antibodies (Alexa Fluor 488, green; Alexa Fluor 555, red; Alexa Fluor 647, purple) as indicated; nuclei were visualized using 4,6′diamidino-2-phenylindole (DAPI, blue); scale bar 100 μm. 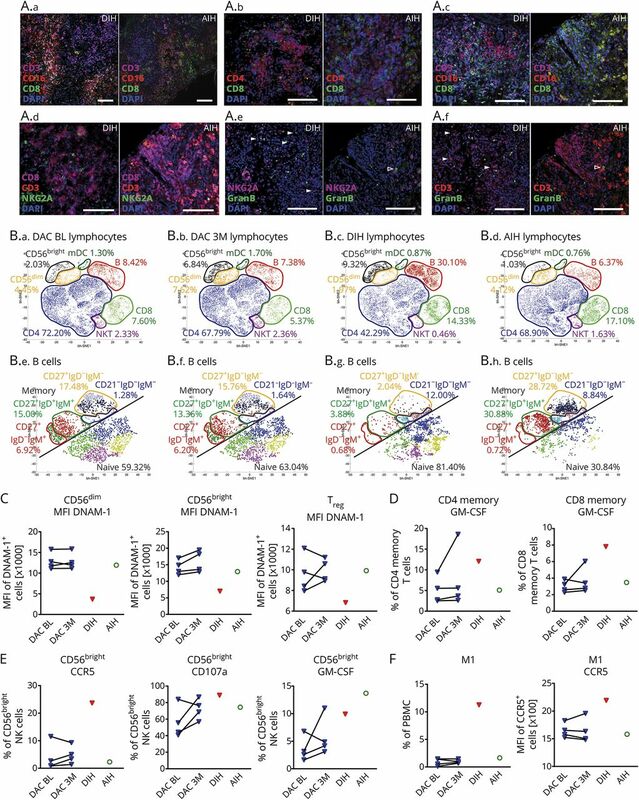 (A.a): Representative image of CD16 + macrophages localized around T-cell infiltration zones. (A.b): Distribution of CD4+ T-helper cells and cytotoxic CD8+ T cells within T-cell infiltrates. (A.c): CD19 + B cells within T-cell infiltration zone. (A.d): NKG2A + CD3− NK cells within T-cell infiltration zone. (A.e and A.f) Granzyme B expression of NKG2A + NK cells (A.e) and CD3+ T cells (A.f) on Sequential sections. (B) PBMC derived from patients with MS (N = 4) before (DAC BL [B.a]) and after 3 months of DAC therapy (DAC 3M [B.b]) in comparison to the index case (DIH [B.c]) as well as the patient with autoimmune hepatitis (AIH [B.d]) were stained with lineage-specific (B.a–B.D) CD1c, CD3, CD4, CD8, CD14, CD16, CD19, CD56) and B-cell subset-specific (B.e–B.H) CD19, CD20, CD21, CD23, CD24, CD27, CD38, IgD, IgM) fluorochrome-conjugated antibodies and acquired by flow cytometry. Lymphocytes and B cells were electronically selected and resulting data were normalized before submitting equal numbers of randomly selected cells to unsupervised cluster analysis by viSNE software. Barnes–Hut Stochastic Neighbor Embedding (bh-SNE) algorithm was used for dimensionality reduction followed by automated identification of lymphocyte (B.a–B.d) and B-cell subsets (B.e–B.H), respectively, by phenograph algorithm. (C) Median fluorescence intensity (MFI) of DNAM-1 expressing CD56dim, CD56bright, and regulatory T cells (Treg). (D) Intracellular expression of GM-CSF in CD4 and CD8 memory T cells following stimulation with leukocyte activation cocktail (PMA, ionomycin, brefeldin A). (E) Percentage of CD56bright NK cells expressing CCR5, or secreting cytolytic vesicles (CD107a+), and expressing GM-CSF as a consequence of co-incubation with HepG2 liver cells. (F) Proportion and MFI of CCR5 of monocytes with a proinflammatory M1-like phenotype.